In 1993 luminaries from around the world signed the 'Oslo Accords' - a pledge to achieve lasting peace in the Holy Land - on the lawn of the White House. Yet things didn't turn out quite as planned. With over 1, 000 Israelis and close to four times that number of Palestinians killed since 2000, the Oslo process is now considered 'history'. 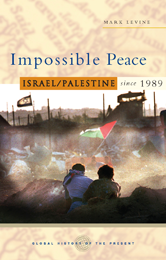 Impossible Peace provides one of the first comprehensive analyses of that history. Mark LeVine argues that Oslo was never going to bring peace of justice to Palestinians or Israelis. He claims that the accords collapsed not because of a failure to live up to the agreements; but precisely because of the terms of and ideologies underlying the agreements. Today more than ever before, it's crucial to understand why these failures happened and how they will impact on future negotiations towards the 'final status agreement'. This fresh and honest account of the peace process in the Middle East shows how by learning from history it may be possible to avoid the errors that have long doomed peace in the region.